Engineering Removal of oil mist or coolant mist for CNC grinders, lathes, machining centers, etc. Capture of fine powders from graphite, cast iron, bakelite grinding operations.Elimination of smoke and fumes from welding, annealing, forging, electro discharge m/c,etc. Electronics Capture of fumes from soldering , cleaning and for Clean Rooms. Textiles Capture of particulates in ventilation and humidification system. Hospitals Capture of dust, bacteria in operation theatres and for Clean Rooms. General For Clean rooms upto Class 1,00,000 without changing existing fan capacity of airconditioning system. The Filters Are Permanant And Are For The Lifetime Of The Equipment .They Can Be Cleaned As Many Times As Required Unlike Standard Filters Which Have To Be Replaced After A Fixed Time Period, Involving A Replacement Cost. The Filters Can Capture Particles As Small As 0.01 Micron As Compared To Just 5 Microns In Standard Filters. Thus Fumes Such As Cigarette Smoke, Welding Fumes, Etc Can Be Captured, Which Standard Filters Cannot Do . The Power Consumption Is Upto 40% Lower Than When Using Standard Filters. The Filters Can Be Used For Recovery Of Oil And Coolant Fumes In CNC Machines, And The Recovered Oil Or Coolant May Be Reused Giving Considerable Savings. Pressure Drop Across These Filters Is Very Low . 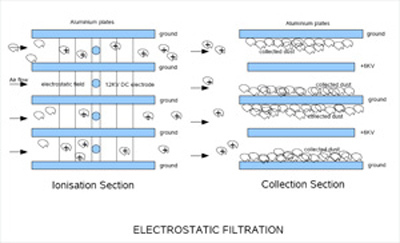 Conventional Filtration Techniques Just Cannot Compete With Electrostatic Filtration As Highlighted Through The Following Table. A two-stage electronic precipitator is constructed in two sections - a charging (or ionizing) section, and a collecting section. The charging section consists of a series of fine wires suspended between metal plates, tubes, air foils or other shapes; the collecting section is a series of parallel flat metal plates. In single-stage precipitators, both charging and collecting are accomplished in one section. Since the end result is much the same as the charging section of a two-stage EAF (Electronic Air Filters), an explanation of the two-stage EAF is sufficient for both types. A dirt particle entering the deluge of gas ions is much like an airplane flying into a rain storm. "Getting wet" is inevitable. As the airborne particles pass through the electrostatic field, the ions "bombard" or collide with and attach to it. The particles then exhibit the electrical charge of the ion "hitch hikers" - the strength of the charge depends upon the number of "hitch hikers" picked up. Therefore, the larger the particles, the greater the electrical charge. This complex charging process takes place in about one-hundredth of a second. The great majority of particles charged in this way have the same charge as the corona discharge wire and are collected on the negative plates in the collector section. To fully understand the operation of the Electronic Air Filter, it is necessary to review, briefly, the molecular structure of matter. A molecule is the smallest portion of any substance that can exist and still retain the chemical characteristics of the substance. Each molecule contains one or more atoms. An atom contains a nucleus, with a positive electrical charge and orbiting electrons, each with a negative electrical charge. The negative charges on all electrons are equal. In an electrically neutral molecule, enough electrons are present to equal the sum of the positive charges on the nucleus. If one or more of the electrons is knocked out of the molecule, the molecule is left with a surplus of positive charge and is then called a positive Ion. A positive Ion in an electrostatic field will be propelled toward the negative side of the field, while the freed electron is propelled towards the positive side of the field. The propelling force is proportional to the field intensity. A negative ion can be formed if a foreign electron is impacted into a gas molecule or into a particle. Free electrons, those not attached to atoms, can be created almost everywhere. Within the electrostatic field of an EAF, free electrons accelerate rapidly toward the positively charged ionizing wires. The rate of acceleration becomes greater as they pass through the increasingly higher field intensity while approaching the wire. On the way to the wire, these accelerated free electrons strike air molecules and knock other electrons out of them. These liberated electrons are then free to strike other molecules. In this way a vast number of positive ions (molecules with surplus positive electrical charge) are created and move rapidly toward the grounded plates. A pale bluish glow appears about the fine wires of an operating EAF. This is a visible indication of a corona discharge. The incoming particles receive their charge from the flow or electrical current (ions) from this discharge to the ground plates of the ionizer. The corona glow is most readily seen on the upstream side of the EAF when it is newly cleaned, operating properly and in complete darkness. Then again, you may not see a glow at all, but this does not mean that the corona discharge is not taking place. When a continuous d-c voltage is applied to a fine wire suspended between grounded metal plates, a "non-uniform" electrostatic field is formed in the inter electrode space (area on both sides of the wire between the grounded plates). The field is non-uniform because it is very strong near the wire, but decreases rapidly as the distance between the plates and the wire increase. Increasing the voltage applied to the wire increases the field strength and its "distance gradation" - until, depending on the relative sizes, the shape of the wire, the distance between wire and plates, and the applied voltage - "corona-start" conditions are satisfied and the gas molecules (air) near the wire are forced to undergo an electrical change. The disruption of the atoms in the ionization process cause energy to be radiated. Some of this energy is of the wave lengths of visible light and under some conditions produces a bluish light around the ionizing wire, giving a visible indication of corona discharge. Let's move our attention along with the charged particles into the collecting section and see what happens there. (Incidentally, the dirt collection that occurs in the charging section or in a single stage electrostatic precipitator is very much the same as what follows). Recall that the collecting section is comprised of a series of flat metal plates set parallel to the air flow through the cleaner. Their spacing varies somewhat from air cleaner to air cleaner, but is usually in the neighborhood of a quater-inch apart. To make the collector work, a high voltage d-c source (+) is applied to each alternate plate and the intervening plates are grounded so there is a high voltage difference between the plates. We can examine the collecting process by viewing what occurs on one set of two adjacent collector plates. (The following statements apply equally well to the whole series of plates). A uniform electric field of force is produced between the two plates when a voltage is applied to them. This force field cause a uniform distribution of electrons (negative charge) on the surface of one plate, and an equal and uniformly distributed deficiency of electrons on the other. The voltage gradation is uniform throughout this field, except at its edges and near sharp corners of the plates. We can examine the collecting process by viewing what occurs on one set of two adjacent collector plates. (The following statements apply equally well to the whole series of plates). A uniform electric field of force is produced between the two plates when a voltage is applied to them. This force field cause a uniform distribution of electrons (negative charge) on the surface of one plate, and an equal and uniformly distributed deficiency of electrons (positive charge) on the other. The voltage gradation is uniform throughout this field, except at its edges and near sharp corners of the plates. A single positively-charged particle entering this field is acted upon by a force equaling the sum of all attracting and repelling forces. These forces are due to the charge on the particle interacting with the field produced by the plates. These forces accelerate the positively-charged particles toward the negatively-charged plate. In the same manner, a negatively charged particles is forced towards the positive plates. The amount of force acting on the particle depends on the particle's charge, the voltage applied to the collecting plates and the space between the plates. The uniformity of the field causes a particle to be acted upon by an equal force regardless of whether the particle is close to a negative plate, to a positive plate, or somewhere between. If no other force is acting on the particle, it moves with a constant acceleration (constant velocity increase) toward the negative plate. Other forces also act on this little particle. These forces are the resistance of the air stream, the repelling and attracting forces between it and other particles, gravity and inertia. These forces affect the movement of the collecting plates, causing the particle to follow an approximate diagonal path to the collector plate. The particles that are collected and are in physical contact with the charged collector plates lose their "opposite charge" and take on the charge of the respective collector plates. Sometimes a prepared adhesive is applied to the collector plates in an attempt to increase their holding power. Such preparations may also make the plates easier to wash. Heavy loading of fine dry particles is one of the few situations where an adhesive may be useful. Most dirt contains enough oil, tar and residue that is naturally sticky so that washing the dirt away is of more concern than the chance of it blowing off while the EAF is in operation. Carefully washing the dirty cell at the correct intervals is the most effective means of effecting efficiency. The Atmospheric Air Is Part Of Us And Is Here To Stay; But What Is The Quality Of Air That We Breathe Day And Night? Society's Future Is Uncertain, At Best, Unless We Heed The Experts And Commit Ourselves To Clean The Atmosphere. The Earth Is Like A Spaceship In That It Is Surrounded By The Troposphere Which Extends About Seven Miles Up. All The Air That Is Available To Everything Living On This Planet Is Contained Within Those Seven Miles. No Fresh Air Can Enter And No Polluted Air Can Escape. It Must Be Used Over And Over Again To Eternity And Each Year It Is Becoming More And More Polluted From Industrial Wastes, Contaminants From Automobiles And From Those Pollutants Formed By Nature Such As Pollen, Mold Spores And Germs. Basically The Problems Of Air Pollution Will Continue To Increase As The Population Continues To Increase And The Earth Will Become Like An Overpopulated Spaceship. It Is No More Practical To Clean The Outdoor Atmosphere Than It Is To Heat Or Cool It. That Is Why The Air Must Be Cleaned Inside Of Buildings Where People Live, Work And Spend Their Leisure Hours. Over The Last Two Or Three Decades Doctors And Scientists Have Demonstrated The Harmful Effects Of More And More Airborne Contaminants. Cigarette Smoke Is Perhaps The Best Known Example, With Doctors Initially Suggesting That Smoking Could Be Injurious To The Smoker's Health, And Then More Latterly, That Cigarette Smoke Could Harm Anybody Who Breathed It, Whether Or Not They Smoked Themselves. It Has Been Said That A Barman Working In A Typical Smoky Bar Inhales The Equivalent Of 15 Cigarettes A Day.. In Industry The List Of Declared Unhealthy Contaminants Has Grown, While The Permitted Exposure To Them Has Decreased. Across The World , Governments Have Endeavoured To Legislate Towards A Healthier Atmosphere In The Workplace-With Varying Success, For The Legislation Needed To Cover Specifically All Aspects Of Industrial And Commercial Air Pollution Would Be Impossibly Complex. What Is Important, However, Is Their Recognition That A Problem Exists And The Spirit Of Their Intentions That Something Should Be Done About It.. The Factories Act Calls For 'All Practicable Measures' To Be Taken To Prevent Workers From Inhaling Dust, Fumes Or Other Impurities Vague As These Provisions May Seem, They Do Represent A Definite Requirement For A Factory Owner To Protect His Employees From Known Specific Dust And Fume Hazards And, Ideally, Any Other Dust And Fumes Which Might Be Injurious. .
Offices Are Not Covered By The Factories Act . While No Specific Requirements Are Set Out As In The Factories Act, It Still Does Call For Ventilation By Circulating Fresh Or Artificially Purified Air. It Is Worth Noting That The Term Office' Is Used To Describe A Host Of Other Rooms In Industrial And Commercial Buildings And, Significantly Bars And Restaurants As Well. There Is No Legislation Which Says Specifically 'You Must Install Some Kind Of Air Cleaner', But There Is A Strong Awareness By All Right-Minded Persons Of The Need To Protect Employees In All Situations From Airborne Pollution, And Failure To Install A Readily-Available Solution Such As An Air Cleaner Could Weigh Against A Company. A mechanical filter can be very effective, for a while, against large contaminant particles, but it won't trap the smaller particles, which in fact make up 9 per cent of all airborne contaminants. Allowing for a degree of latitude, a mechanical filter could be said to be 5-10 per cent effective in trapping all airborne particles. Using the same criteria, an electrostatic air cleaner will trap 70-95 per cent of all particles. Powertech Fumekiller / Dustkiller , in fact uses mechanical filters as pre-filters in its electronic air cleaners, removing the larger particles and enabling the electrostatic section to operate without hindrance in its more important job of removing the particles which are too small for a mechanical tilter to catch. A word is needed about what big and small particles are. The size of airborne particles is normally measured in microns. A micron is 0.001 mm, or about 1 /25400 in. A pencil dot is around 50 microns across. The third approach adopted for clearing the air is not to attempt to clean it, but just to blow it outside with a fan. This is clearly unacceptable in many situations where the fan is blowing out air that has been heated, replacing it with air from outside that has to be heated, only to be blown back outside again. It can be shown that up to 80 per cent of the cost of heat wasted in this way can be saved by recycling the heated air through an electronic air cleaner rather than wasting it with an exhaust fan. This is another direct financial benefit to add to those achieved on reduced cleaning and decorating bills. In an industrial context, while not necessarily having any directly harmful effect on the environment, a policy of exhausting contaminated air outside into the atmosphere could cause bad feeling between a factory and its near neighbours. Some odour molecules collect on the particles which are removed by the Electronic Air Filter. The low level of ozone produced by the air cleaner oxidizes some odor molecules. The unit of measurement used to describe the size of particles and gases is the micron.One micron equals one-millionth (1/1,000,000 or.000001) of a metre; 25,400 microns equal one inch. An average diameter of 10 microns is considered to be the dividing line between visible and invisible particles. An electron microscope can resolve particles down to 0.005 micron in diameter. If air currents do not aid their suspension, visible particles greater than 10 microns in diameter settle quite rapidly because of gravity. The visible particles, however, constitute a minor percentage of the particles in the air. 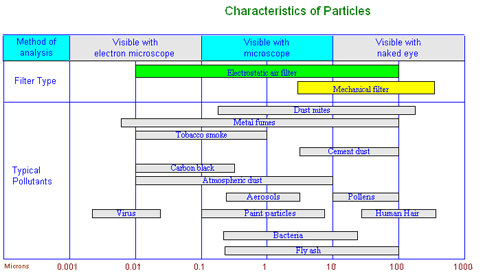 Particles less than 1 micron in diameter has so little mass that gravity has negligible effect on them.On a particle count basis over 99% of the particles in a typical atmosphere are below 1 micron in size . . . even clean country air will normally contain over 1,000,000 particles per cu ft2. The weight of a particle increases proportionally to the cube of its diameter. The following classification of air contaminants into types is based on the physical state of the contaminant (solid, liquid or gas) and the normal physical state of the material from which it originates. Dusts are minute solids projected into the air by the breaking apart of large solid masses or simply by the scattering of pulverised material. When natural forces such as wind, volcanoes and earthquakes produce excessive amounts of atmospheric impurities in the form of dusts and flyash they become contaminants. Mechanical processes that create dusts often include crushing, grinding, demolition, blasting, drilling, shovelling, screening and sweeping. Dust explosions can be produced when organic or mineral dusts are exposed to a source of ignition in an enclosed area. The high concentration of organic dust in flourmills and grain elevators is a prime example of locations where dust explosions might occur. Often a primary explosion occurs from the ignition of a small amount of dust. This can dislodge large accumulations of dust on horizontal surfaces, which produces a larger secondary explosion. Fumes are very fine solids formed by the condensation of vapours of combustion from materials that are normally solid. Metallic fumes such as iron, copper and zinc oxide are generated from molten metals and usually occur as oxides because of the chemically reactive nature with the available oxygen in the air. Fumes which are permitted to age are said to 'flocculate' into clusters of larger size. Pollen which comes from weeds, grasses and trees is responsible for hay fever and some allergies. Although ragweed pollen ranges from 15 to 25 microns in diameter, most pollen grains vary widely in size and their weight varies according.